Sounds delish. Hoping to give it a go and will let you know how it tastes. One of my guilty pleasures is reading cookbooks, and the year before last I received an amazing banking book: Home Baked Comfort. It’s been almost a year since I made anything from it, though, and last night I just had to get back into it. 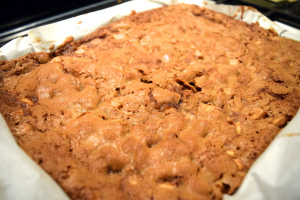 I did so with Apple Whisky Cake because (a) my husband loves whisky and (b) I love recipes with brown sugar. So for my take on this dish, I ended up making few small changes, so I have my recipe below, but remember that the original recipe can be found in Home Baked Comfort, and there is a copy of that original recipe online. Hope you like the changes I made, I found this totally addicting!